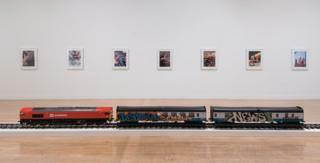 The winner of the £25,000 Turner Prize is to be announced at a ceremony in London later. Artists Anthea Hamilton, Michael Dean, Helen Marten and Josephine Pryde are all in the running for the honour. The prestigious prize is awarded to a British artist, under the age of 50, considered to have put on the best exhibition of the last 12 months. Its stated aim is to "promote public debate around new developments in contemporary art". The awards ceremony will take place at Tate Britain, and will be broadcast live on the BBC. Painter and sculptor Marten's art is described as "slippery and elusive" and Pryde's work shows a fascination between art and photography. Marten won the first Hepworth Prize for Sculpture recently, and pledged to share the £30,000 award with her fellow nominees. Image caption Michael Dean's work is made from "aesthetically-overlooked materials"
Last year's prize was won by design collective Assemble for a regeneration scheme for derelict houses in Liverpool. The ceremony will be broadcast live on the BBC News Channel from 21:30 and BBC World and will be available online later.